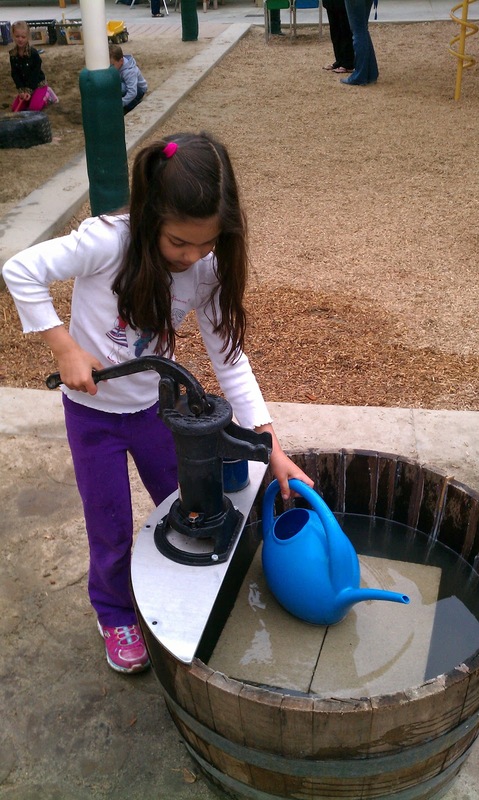 We recently added this beautiful barrel pump to our Outdoor Classroom. It was a simple addition, yet it has added a wealth of engagement in our OC. Our garden has been an integral part of our yard, however, we have always needed a staff member present to fill our little ones' watering cans with the hose. This old-fashioned barrel pump was the perfect solution. 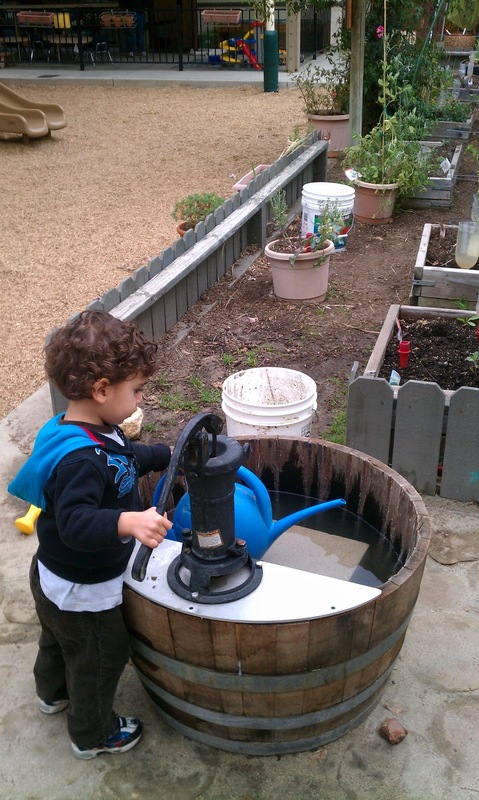 Not only do the children flock to the pump to fill their canisters for watering their class gardens, but the pump offers unique lessons on water flow, cause and effect, and the new gross motor movement of pumping the handle up and down. In fact, our three year olds were so intrigued with the pumping action, they didn't even venture into filling containers until after a few days! The pump was built by one of our handy parents. We simply purchased a large wine barrel and an "old fashioned pitcher pump" at our local hardware store. Click HERE to find the model we used. The entire system cost approximately $70! Our handy parent then caulked the barrel, installed the metal platform, and then bolted on the pump. I bet it gets a ton of use! We have one attached to a rain water tank right by the sand pit and it is one of the best things we ever did. Kristin, I have been trying to figure out how to get a hand pump inside. Any ideas or is it too wet for inside? Tom - It is wet. VERY wet! Although, if you could rig it to the large blue water table that you have, it might work. But it will still be wet. VERY wet. It's just great! I know my schools would love these. I must get onto this! This is a great "history" lesson in an outdoor classroom. I wish more kids would learn how things use to be. I think kids would be more grateful for what they have if they realized how far we have come over the last century. I have seen these at historic site. What fun to have them at school! I have never seen blog like this,you showed me new inventions of small water pump for garden.I really liked your blog. I am looking to install one of these at my daughter's co-op preschool and I love your design best of all i have seen. Have you had problems with the barrel shrinking when empty?